It was just announced at MIX09 that ASP.NET MVC 1.0 has been released for general use and is out of the Release Candidate phase. There has been no word on the changes form RC 2 to this release version. But I will keep this post updated as I learn more. Also as of writing this the download hasn't been posted to CodePlex either, but I am sure that it will be posted pretty soon. I am assured by Wrox that the cover of the book will be updated to look like what is on the right of your screen. So it should be any day now, so go pre-order a copy today by clicking on the cover image to your right and it will take you to the Amazon page where you can place your pre-order. That way as soon as the book ships you will have a copy waiting on your front porch. Update: It is available from Microsoft Download. Probably on CodePlex by the end of the day. Here is the final description of the download for your reading pleasure. 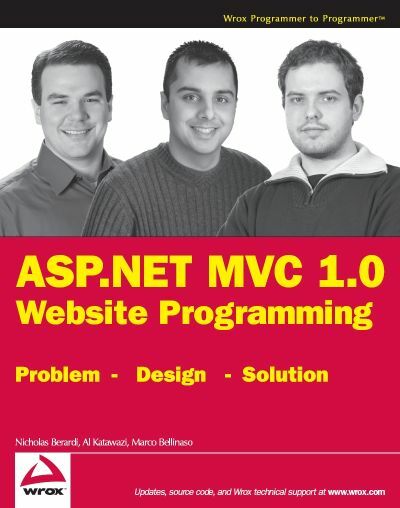 ASP.NET MVC 1.0 provides a new Model-View-Controller (MVC) framework on top of the existing ASP.NET 3.5 runtime. This means that developers can take advantage of the MVC design patterns to create their Web Applications which includes the ability to achieve and maintain a clear separation of concerns (the UI or view from the business and application logic and backend data), as well as facilitate test driven development (TDD). The ASP.NET MVC framework defines a specific pattern to the Web Application folder structure and provides a controller base-class to handle and process requests for “actions”. Developers can take advantage of the specific Visual Studio 2008 MVC templates within this release to create their Web applications, which includes the ability to select a specific Unit Test structure to accompany their Web Application development. The MVC framework is fully extensible at all points, allowing developers to create sophisticated structures that meet their needs, including for example Dependency Injection (DI) techniques, new view rendering engines or specialized controllers. As the ASP.NET MVC framework is built on ASP.NET 3.5, developers can take advantage of many existing ASP.NET 3.5 features, such as localization, authorization, Profile etc. Update: Phil Haack just posted his MVC 1.0 Release Anouncement.